Sometimes beautiful things just catch my eye, and it really doesn’t matter how much they cost. In fact, the less they cost, the better. My little town is fairly isolated — about two hours from any decent shopping — so when I travel, I like to shop. During a work trip to San Francisco a year and a half ago, I went in a CB2 with some friends who were shopping for appetizer plates. I had no intention of purchasing anything, but these tumblers caught my eye. 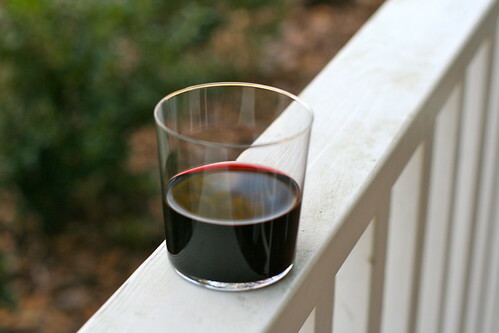 The glasses are technically double old-fashioned glasses, but they are just the right size for wine. 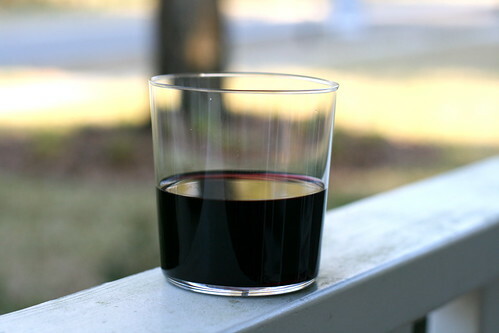 And, of course, at about $2 per glass, it doesn’t matter much if one breaks. I usually use them for red wines. Sometimes I drink a white in it, but only if it’s a white wine that can tolerate a bit of warming up since hands tend to warm up the glass. And in this glass? 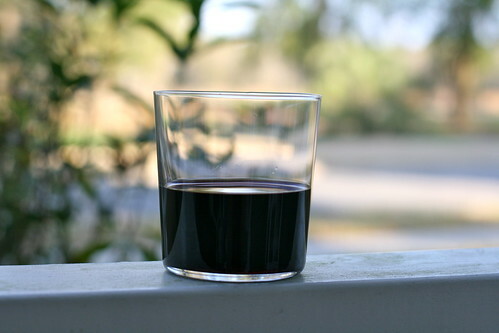 A 2008 Mollydooker Two Left Feet, a shiraz blended with a bit of merlot and cabernet sauvignon. You can find the wine here, and the glasses here. My life is crazy. Let me just put that out there. Since I finished medical school almost ten years ago, I have worked full time (and sometimes way more than full time). Almost 6-1/2 years ago, my daughter was born. And then three years after that, my son was born. And I still work full time, because I love what I do. My husband works a lot, too, because he loves what he does. My daughter is in kindergarten, and my son is in preschool. Both kids just started swim practice – this week, in fact – and that activity now takes up a good hour in the evening twice a week. So, my point? It’s really hard to make time to cook. Really, really hard. I have found some tools that help me survive these crazy work weeks. One of them is my husband, who shares in all the household and parenting responsibilities equally — but you can’t have him. A couple of other tools that I rely on are my slow cooker – an ancient appliance that was a hand-me-down from my mother-in-law and looks like it might be straight out of the 1960s – and my electric pressure cooker, a Cuisinart. 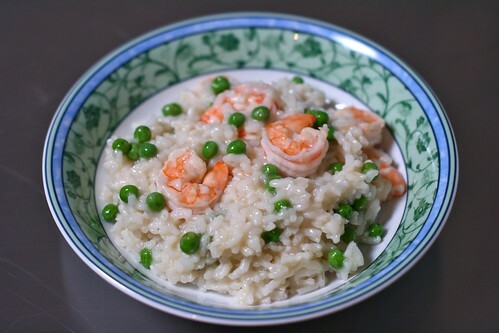 Earlier this week, during one of those usual crazy days, I decided to utilize my pressure cooker to make a risotto. 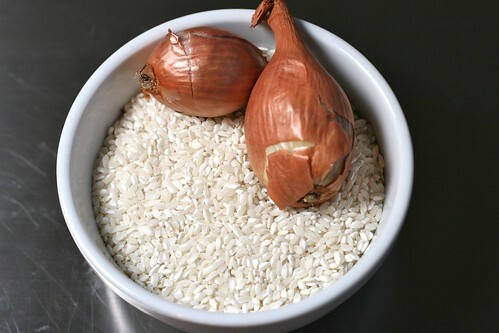 It’s so simple and straightforward, and I can have a risotto prepped in no time. Thankfully, I like risotto. The pressure cooker is good for other things too, but the fact that I could make risotto in the pressure cooker was a bit of a surprise for me. Hence, this post. As I mentioned in my last post, we have this great little fish market in my neighborhood. I stopped by on the way home from work and picked up some fresh St. Augustine shrimp. Everything else I had on hand. Turned out to be a perfect – and quick – weeknight meal, with plenty of leftovers for the next night. 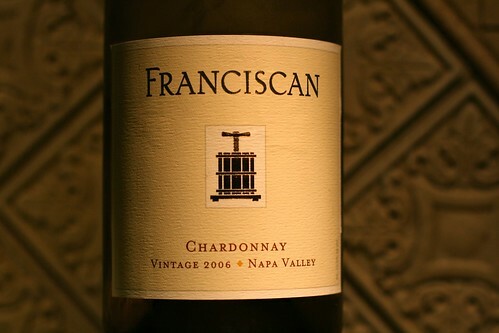 For the wine for this meal (both for cooking and for drinking), I opened a 2005 Franciscan Chardonnay from Napa. This chardonnay is a lighter, crisper style than one might think of in a traditional chardonnay. It worked well with this dish, but I probably would have preferred a sauvignon blanc or a riesling given the hint of spiciness in the shrimp from the crushed red pepper. These directions are for using an electric pressure cooker. 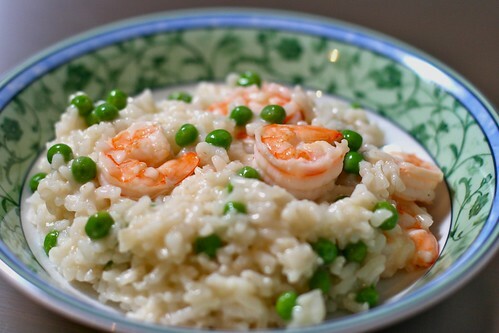 You can always use your traditional risotto recipe if you don't have a pressure cooker. In a skillet over medium heat, melt 2 tablespoons butter. Add garlic and crushed red pepper. 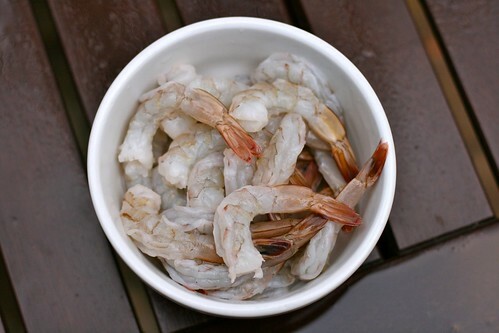 Add shrimp and saute for 2-3 minutes or until shrimp begin to turn pink. Add 1/2 cup white wine and simmer until shrimp are done, another 2-3 minutes. 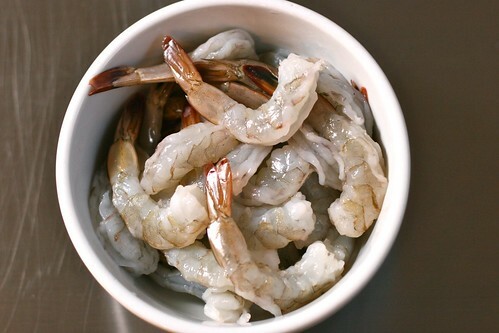 Remove shrimp with slotted spoon and set aside. Pour cooking liquid into bowl and reserve. In the pressure cooker, place 1 tablespoon oil, 1 tablespoon butter and the chopped onion or shallot, and saute for 2 or 3 minutes until the onion/shallot is translucent. Add the garlic and saute for another minute. Add in the arborio rice and cook, stirring frequently, until the rice is opaque (about 3-4 minutes). Add the wine and salt and cook for another 2-3 minutes or until the liquid has been absorbed. Add 4-1/2 cups chicken stock, stir, and set the pressure cooker to high pressure and cook for 6 minutes. When the 6 minutes is up, use the quick release to release the steam in the pressure cooker. Open the lid carefully. To risotto, add in 1/4 cup of reserved shrimp cooking liquid and the last 1/2 cup of the chicken stock. Stir until absorbed. Add in the shrimp and peas. Serve immediately. Our suburban neighborhood is blessed to have a bakery and a fish market within its midst. I try to stay out of the bakery, mostly because the pastries are just too good to resist. The fish market, on the other hand, is a treasure trove of enticing fish and shellfish. We are only about an hour away from the Gulf coast – and some of the best fishing locations in the state – so the market has a regular supply of great fresh seafood. As I’ve mentioned before here, I’m on a mission to learn to cook things I’ve never cooked before. I’ve never cooked scallops, but I love them, and they draw my eye when I see them in the enclosed glass case in the front of the fish market. I’ve been intimidated by scallops, but this weekend I decided it was time to get over that hurdle. So, while I took my daughter shopping for spring clothes, I sent my husband on an errand to buy scallops. I found a recipe in Gourmet Today that I thought I’d give a try. 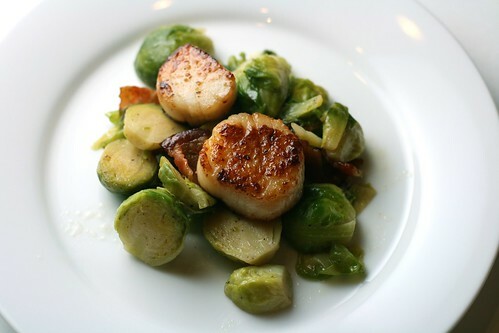 After all, the scallops were served over Brussels sprouts with bacon. I mean, what sounds better than that? The Brussels sprouts were fantastic, as expected. They were tender, with no trace of the bitterness that turns many people off, and the crispy bacon bits added a nice salty, smoky flavor. Searing the scallops was a bit of a challenge for me. I blame my husband for this, for no good reason except that he purchased the scallops and he was standing nearby. However, I managed to accomplish my task. And, although it was not pretty, the sweet scallops were delicious and a great compliment to the Brussels with bacon. And I forgave my husband and all was right with the world. And before I forget, let’s talk about the wine. No meal is complete without the wine, you know. 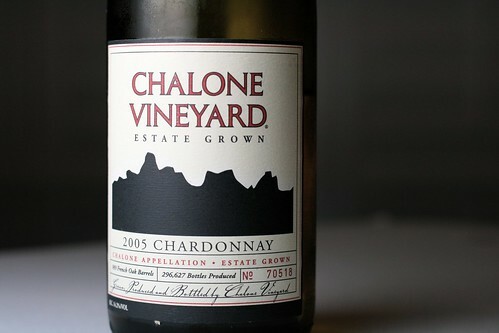 We paired the scallops and Brussels with this yummy 2005 Chalone Estate Chardonnay, and it was a great combination. Preheat oven to 200 degrees (for warming the Brussels sprouts when done). 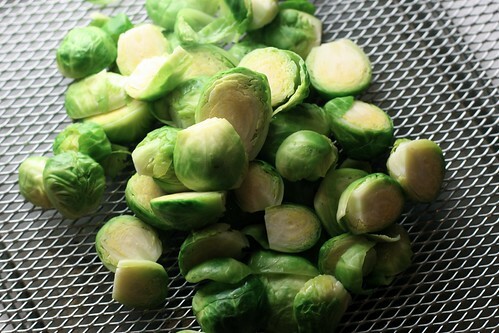 Blanch Brussels sprouts in boiling salted water for 2 minutes; drain and set aside. Cook bacon over moderate heat, turning occasionally, until crisp. Transfer bacon with slotted spoon to paper-towel-lined bowl and reserve rendered bacon fat in another small bowl. Add 1/3 cup chicken stock and 1/4 cup water to skillet, bring to simmer, and scrape up any brown bits. 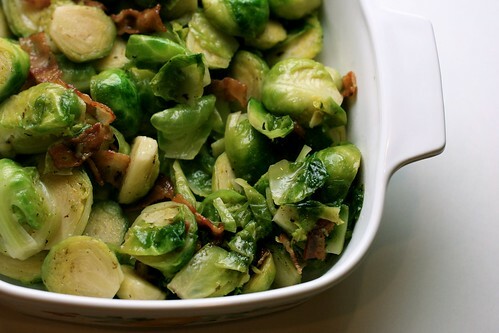 Add sugar, butter, 1/4 teaspoon salt, 1/8 teaspoon pepper, and Brussels sprouts to pan; simmer uncovered for 4 minutes. Remove lid and cook over moderately high heat for another 8-12 minutes or until liquid has evaporated and sprouts are tender (to your liking). Stir in bacon, transfer to a platter, and keep warm (covered) in oven. Wipe skillet clean. Pat scallops dry and season them with 1/4 teaspoon salt and 1/8 teaspoon peper. Heat oil with 2 teaspoons of the reserved bacon fat in the skillet over moderately high heat until the oil/fat begins to smoke. Add scallops and sear, turning once, until golden brown and just cooked through, 4-6 minutes. Transfer to another platter and cover loosely with foil. Pour off any remaining fat from skillet. Add remaining 1 cup chicken stock, bring to simmer, and scrape up any brown bits. Simmer for one minute. Stir cornstarch with 1 tablespoon water in a cup, then add to sauce (along with any juices accumulated in scallop platter), and simmer for 1 minute. Remove from heat and stir in lemon juice and salt and pepper to taste. 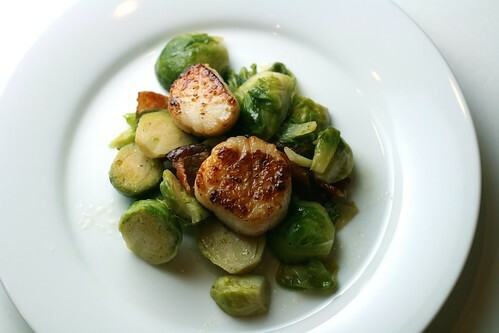 Serve scallops over the Brussels and top with sauce. Slightly adapted from Gourmet Today, and here.